Lemonade is the perfect place to order catering for NFL Sunday, college game day, or any sports gathering throughout the fall season! Our fresh, flavorful menu showcases the best of California using seasonal ingredients and exquisite flavorings to offer a unique and delicious catering experience that your guests will be raving about all game day long! Our Sunshine Sandwich package offers an assortment of delicious chef’s sandwiches and a choice of either a mixed green or marketplace salad. Customizable and with the option of adding any of our delicious menu items to serve your guests, our sandwich package is the perfect option for a quick, easy and affordable party food. You can count on each and every sandwich to have the delicious quality you’ve come to expect from us. No game day is complete without a sandwich and Lemonade gives you a refreshing experience compared to the usual food options served on Sunday. Our delicious Wellness Packages come with a Land & Sea entree of your choice and two marketplace salads. A delicious and healthy option, fully customizable and with the option of adding any of our seasonal menu items to your order. With fresh seafood or hearty farm choices paired with two of our handcrafted salads, your catering choice will be the hot topic at your next game day party. For a truly convenient option, just order our classic lunchboxes! Each lunch box includes a half or full chef’s sandwich, one marketplace salad, and a bag of seasoned kettle chips. Add on our decadent brownies or cookies to give your guests a delicious and satisfying meal! This is perfect for a personalized option to offer each of your guests that is a little different from the typical buffet style on game day. Order Lemonade Catering Throughout Football Season! 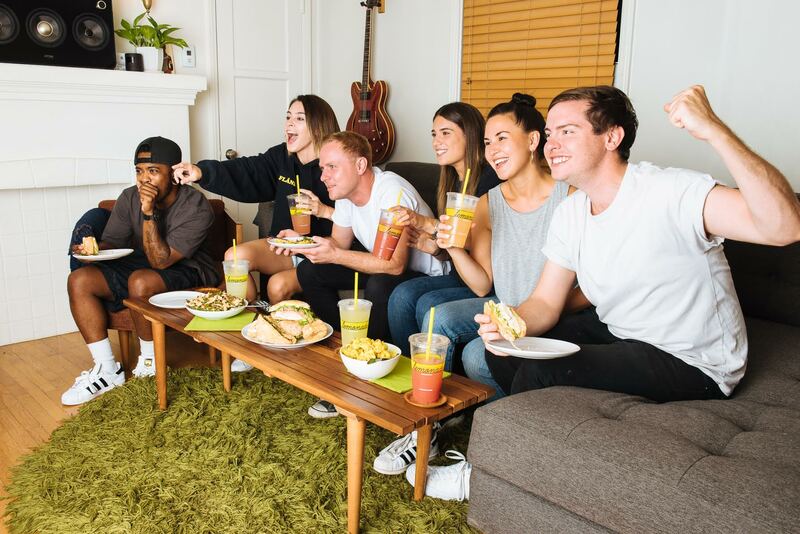 From the first kickoff of the season to the playoffs, Lemonade is here to provide the food so all you have to worry about is cheering for your team and hanging out with your friends and family. We welcome you to explore our catering options, or give us a call at 310-463-9998 if you have any questions about the services we provide. You can also reach out to us at our contact page. We can’t wait to be a part of your next game-day party!